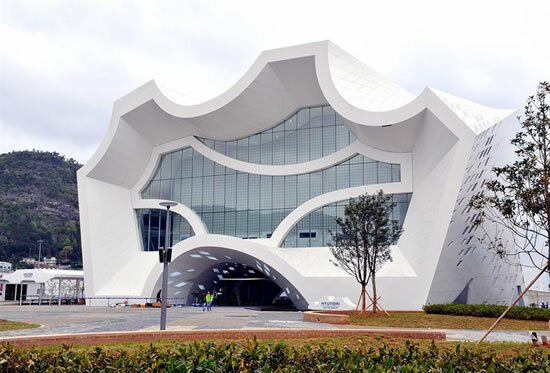 Hyundai Motor Group, an official Global Partner, of the Expo 2012 Yeosu Korea, today released photos of its exhibition pavilion. The Yeosu Expo will be open to the public on May 12, and run for three months. Hyundai will operate a Hyundai Motor Group exhibition pavilion of 1,398 m2, the largest in size among corporate pavilions, which will provide visitors with an opportunity to experience what Hyundai is doing to realize its vision of Together for a better future. 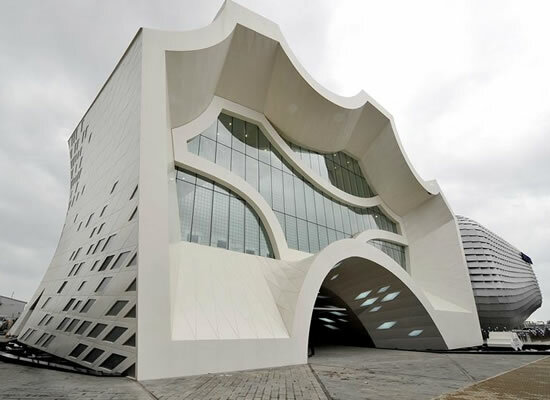 Based on the concept, called Vision Gate, the pavilion’s front facade expresses Hyundai Motor Group’s closed-loop recycling system, connecting five core business areas of steel, automotive, engineering & construction, parts and logistics. The back of the pavilion represents a stylized letter H, symbolizing Hyundai Motor Group. The pavilion principally consists of four districts titled Connecting, Growing, Innovating and Gathering, displaying Hyundai Motor Group’s vision in a variety of forms.